Big Flavor, Big Vegan: Robin Asbell tells us what it took to write such a BIG book full of flavorful recipes. Plus, all about the VegNet Bend and Peace Advocacy Network sponsored Vegan Pledge. 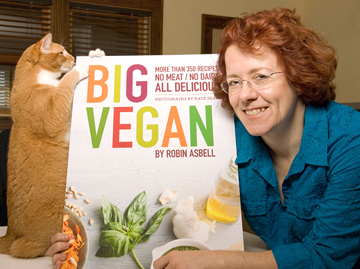 We talk with Robin Asbell, author of Big Vegan: No Meat/No Dairy, All Delicious. Big Vegan is a 500+ page comprehensive cookbook full of flavorful and approachable recipes inspired by global cuisine. Robin is a Minneapolis based cookbook author, freelance writer and recipe developer, private chef, and culinary instructor who also gives talks on the topics of whole grains, whole foods, and eating well. Robin blogs at: robincooksveg.wordpress.com and posts at The New Vegetarian Facebook page. Find out more about Robin at: robinasbell.com. This scrumptious looking recipe includes dried mushrooms, thinly sliced fresh shiitake mushroom and portobello caps, as well as seitan, white miso, white wine, tomato paste, nutritional yeast, toasted walnuts, and a variety of surprising herbs and spices. Please find the complete recipe on the Chronicle Books Blog here. Strictly Organic Coffee has several vegan options and items that can easily be made vegan. There is usually a vegan soup on the menu, along with a hummus plate and hummus veggie wrap. A breakfast burrito with potatoes and veggies can be made vegan on request, and soy sausage can be added. They serve certified organic and fair trade coffee that they roast on location. A variety of nuts milks are available. Strictly Organic has two locations: 6 SW Bond Street and 450 SW Powerhouse Dr. at The Old Mill. For more information, see strictlyorganic.com. Woody Harrelson: Actor, vegan, raw foodist, passionate environmentalist, peace activist. VegNet Bend monthly meeting and potluck: 6p, January 25, The Environmental Center, 16 NW Kansas, Bend. Bring a vegan dish, your recipe, and a place setting. This month, the group is going to view trailers of some intriguing films that have come out in the last year or so, including Vegucated, Bold Native, May I Be Frank, Fat, Sick and Nearly Dead, How I Became An Elephant, and Processed People. Please come and vote on which films you’d like to see for movie nights in 2012. VegNet Bend will also be hosting a 30-day Vegan Pledge beginning January 29 and continuing for 5 Sundays through February 26. It will include programs, speakers, cooking and shopping tips, and more. If you’re interested in exploring the benefits of a vegan lifestyle, but need a little support, this is the pledge for you. Sign up at vegnetbend.org.